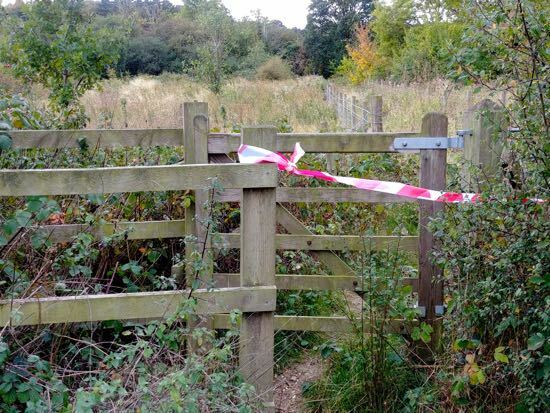 The North Mymms Parish Council run Moffats Open Space was cordoned off this morning following another escape of horses from Leach Fields. Just before midday, a thin foal, its mother, and another horse were rounded up and returned to their field. 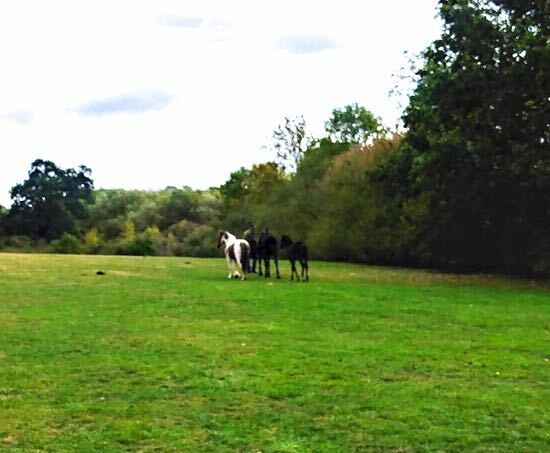 Horses roaming freely along public footpaths and through the public open space has become a regular hazard, with all the paths around Leach Fields littered with horse droppings, some new, but many old. 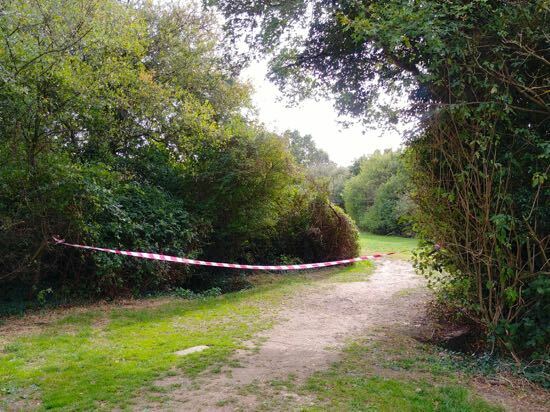 Hertfordshire police and North Mymms Parish Council were alerted and the area cordoned off, but dog walkers ignored the red and white tape and continued regardless. One, who didn't want to be named or photographed said the horses are "always escaping". 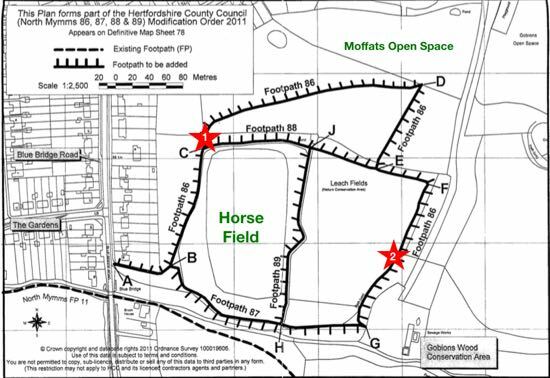 The map above shows the field the horses escaped from and the footpaths around Leach Fields. The red markers show where the paths are blocked. The marker with the number one is where the fallen tree lies, only the extremely agile can clamber over it. 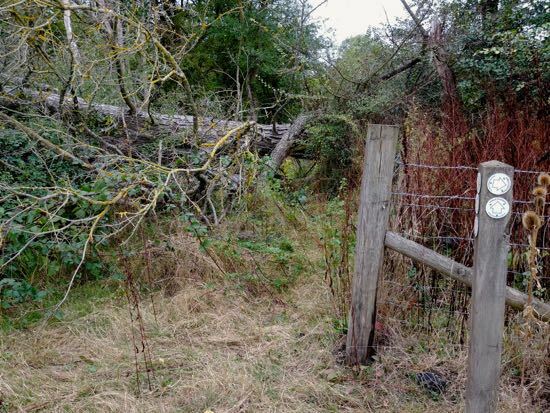 The marker with the number two is where brambles and thorns block the way, although there is plenty of evidence on the path showing that it's been used by escaped horses. The fences that are supposed to contain the horses are in need of attention. There are several spots where they have been trampled down, with rotted and collapsed fence posts failing to support the sagging barbed wire and mesh. And it's not only the fences that need of looking at, some of the footpaths around Leach Fields are in poor condition, too. 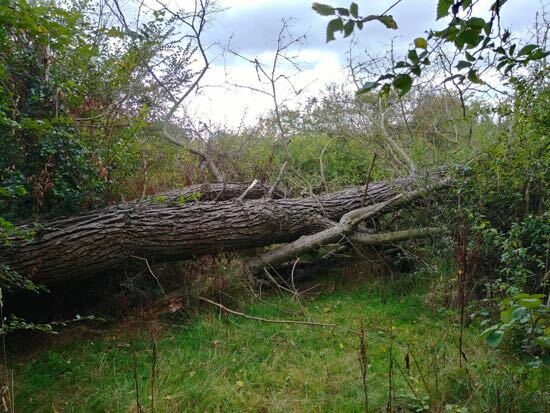 The path that runs north to south on the eastern side of the fields is blocked by brambles and thorns, and the path running along the north-west corner of the fields is totally blocked by a fallen tree. 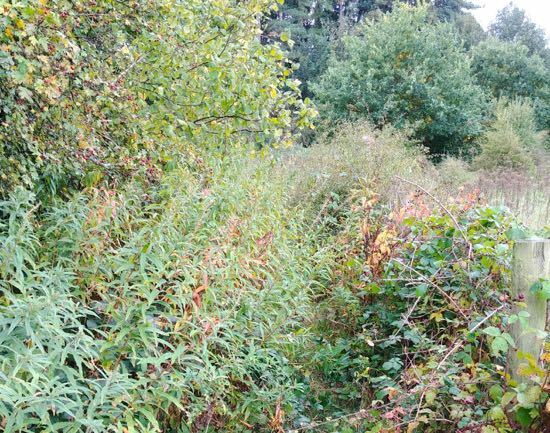 The eastern part of footpath 86 is totally blocked with brambles and thorns. 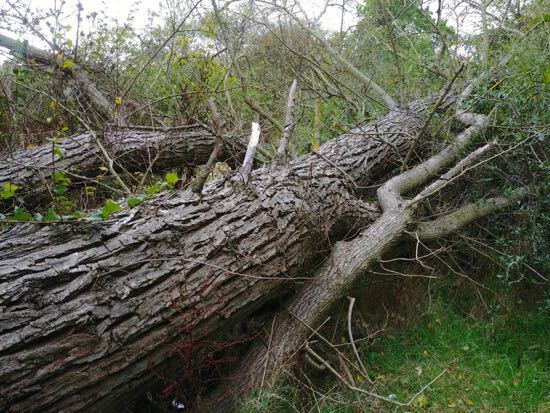 Hertfordshire County Council's footpath team has been notified. They are usually quick to respond. Have you encountered horses roaming freely on the footpaths along Leach Fields? If so, feel free to add your comments below.